There is a collecting feeling of blah, anger, depression, and exhaustion in the air. The people I interact with on a daily basis are beyond survival mode. Each day seems to bring a new array of feelings and emotions. My children can feel the thickness in the air and we have talked to them about the climate of this place they call home, America. We have been talking about the upcoming election, the intense times upon us before the morning of July 6th, when a video out of Baton Rouge, LA showing a man named Alton Sterling under the hail of bullets from a police officer’s gun. My husband and I woke up and like most people in our demographic – you check for texts, work emails, Twitter before we pop up and get with our day. There is was. There it was again. Damn. Again. What cuts the deepest is that within my children’s short lifetimes, two things will seem quite normal – having a Black President and knowing that each summer brings death and protests and videos they cannot watch and summer is in full swing. Every summer, this keeps happening. This keeps repeating. And yet, I am still not numb, I am not used to it. I continue to feel the impact of each blow, each bullet, each one taken from us, and each time justice becomes a fleeting fantasy. We go back to the norm, we all have to go to work and school and in this area, there are usually only a few folks that even know I might be having some emotionally trying times. The fact that it is summer and life is a step behind, means that I can avoid the intense interactions with folks that cannot see what is happening and the ones that don’t know what to say to me, but it also adds to the sedentary nature of how I am processing this pain. In another part of my life, I just received a hefty grant to do the work that I have been dreaming to do at the W. E. B. Du Bois Center. And I am finding it difficult to celebrate. I appreciate the exciting news and realize that we all needed some light in this moment of darkness. Yet, I am finding it hard to wrap my head around the next step, the meetings I have tomorrow. As Dr. Du Bois said so long ago, it’s that two-ness that has to kick into full gear and soon. I have a deadline coming up very soon and a lot of work to get this next article to the point of publication. And I am finding it difficult to write. I thought that maybe it is because I write about race and slavery or the larger implications of Caribbean tourism on local communities or race and gender and class and all those junctures of intersecting and overlapping, but no, its just that writing is hard. And when I frequent my regular writing spots, it is blaringly obvious that I am living in a mostly white place. No one around me seems to be phased, I don’t feel the thickness in the air of my coffeeshop, I can’t see the pain across the brows of strangers I come into contact with in the market or store. When I see other global majority folks around town, I can feel it, I can see it, because we all know its summer again and this is what happens between those summer vacations and the pressing home improvement projects. Bullets on a summer’s night used to mean something different when I was growing up. The heat, the city, the inevitable (and occasional) clash of one kind or another could sometimes lead to moments of extreme exchanges where things got out of control, but it was different. This is different. 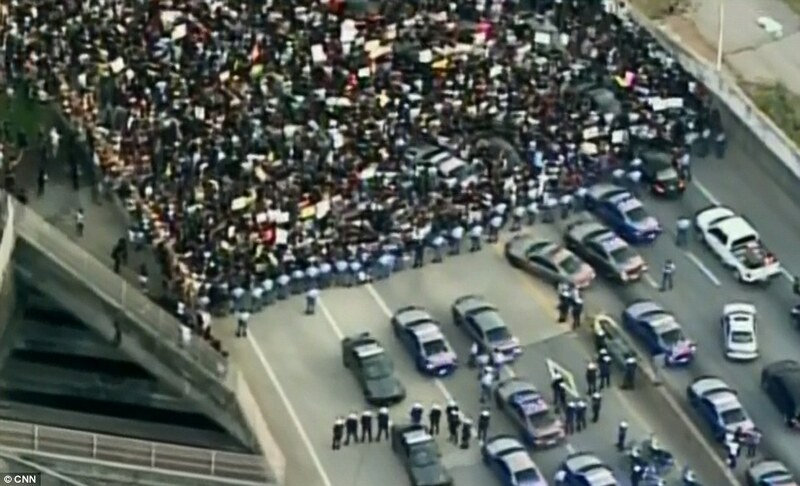 I had to include a pic of protesters in Atlanta, the power of people is what we need. Another summer of this means it’s time to put our pens a laptops aside for a moment and get out of our houses and our comfort zones and take a stand, lift a voice, teach each person you come into contact with that the time has come to call out bad people – in and out of uniform. Tomorrow is a new day, let’s see what the dawn brings.